What began in 2012 has come true. 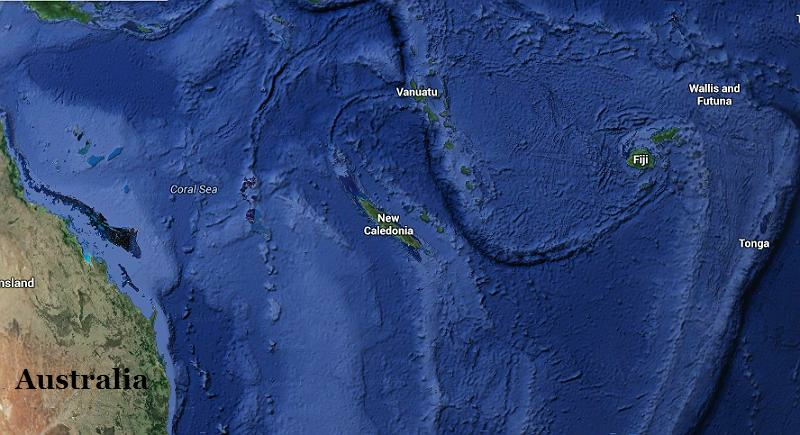 On April 30th, 2014, Conservation International announced in a press release that an area 1.3 million km squared is protected by the government of New Caledonia. The region is a UNESCO (United Nations Educational, Scientific and Cultural Organization) World Heritage Site known as The Lagoons of New Caledonia: Reef Diversity and Associated Ecosystems. 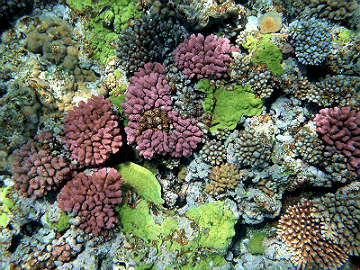 1) It's not too late to restore coral reefs that have been reduced by half. 2) We can restore and protect sharks which have been depleted by 90% - mostly in the last 30 years. (And other species that also live in the area). 3) We can prevent the spread of dead zones that blight coastal areas globally. To get a better idea of the region, I used Google Maps to take a screenshot of the area. New Caledonia is a French region (a special collectivity of France) located in the southwest Pacific Ocean approximately 1,210 km east of Australia, northwest of New Zealand. 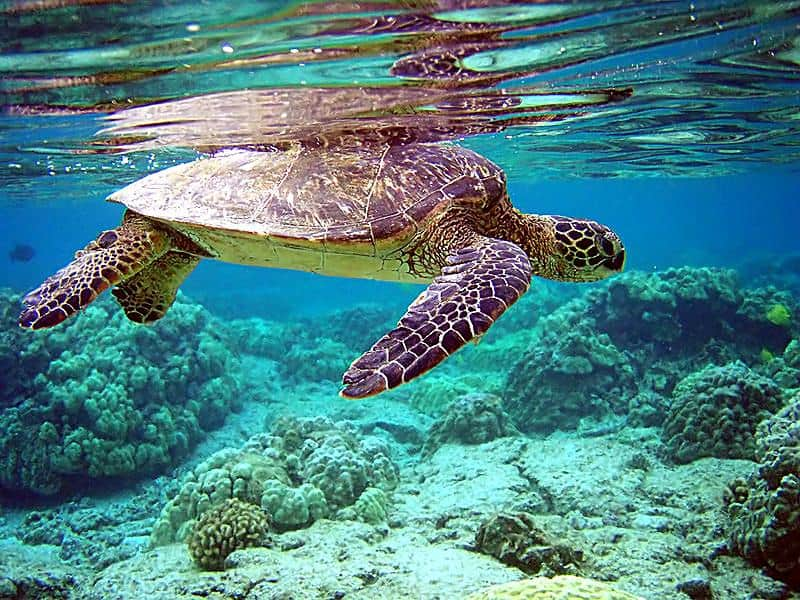 Prior to this legislation, 4% of France's marine waters were protected; now 16% of it is. Julien Willem (Wikipedia) / Licensed under Creative Commons Attribution-Share Alike 3.0 UnportedThe great thing about this is that the area will be thoughtfully managed (incorporating best practices) to ensure the protection of species, their habitats, and ecosystems. With legislation comes monitoring and preservation. 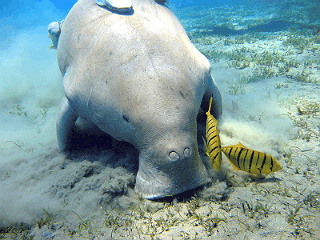 Although the area is home to 23 species of birds not found anywhere else, vulnerable dugongs (right photo), and a nesting site of the endangered green sea turtle (Chelonia mydas), zoning will be established for both conservation and economic development. US Government Employee (Wikipedia) / Public DomainOne of the key reasons it's important for the rest of the world to follow suit is that marine ecosystems (which provide a crucial protein source to a billion people worldwide) are being destroyed. What's worse, these areas are unable to recover. The most destructive way we are losing vital sea life is because of a fishing method termed "bottom trawling." In 2006, the UN Secretary General reported that 95% of damage to underwater seamount ecosystems (worldwide) is caused by deep sea bottom trawling. 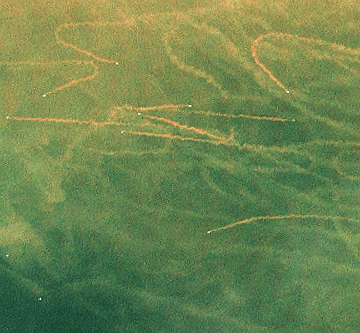 I was stunned to learn how much devastation bottom trawling causes when I viewed an 8:30 minute documentary presented by Sigourney Weaver in 2009 (shown next). "We are in the situation where 40 years down the line we, effectively, are out of fish." 1) Limits must be imposed and enforced on fisheries to maintain marine life populations. 2) Fishing methods (like deep sea bottom trawling) must be made illegal or modified to limit bycatch to an acceptable percentage. Presently, about 27 million tonnes of marine life is thrown out (often cast overboard, dead or dying). Shrimp trawling is responsible for 1/3 of the world's bycatch, yet only comprises 2% of all seafood. 3) Monitoring and policing of the fish and seafood trade. Much of the catch from pirate fishing still ends up being sold and consumed. 4) Marine ecosystems, such as coral reefs and spawning grounds, need legally enforceable protection. 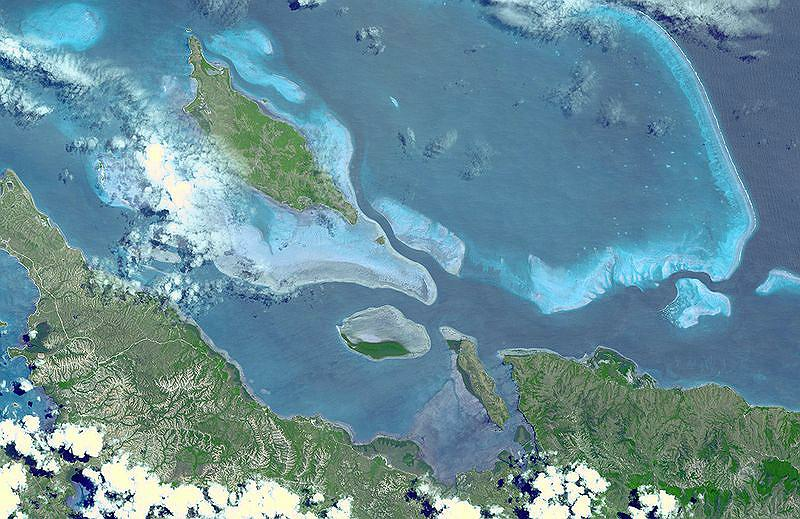 Worldwide, we need to expand MPAs (Marine Protected Areas) - the way New Caledonia has - where fishing is banned (i.e. no take areas) or restricted. 5) Consumers need to lower the demand for certain seafood by not purchasing threatened or declining species. And, I feel, we need seafood in the marketplace to be clearly identified as sustainably-sourced product. Last year, I wrote an article titled 2013 - International Year of Water Cooperation. During my research for it, I accessed a February 27th, 2013 press release titled: NASA’s Aquarius Sees Salty Shifts. Principal investigator Gary Lagerloef, of Earth & Space Research, noted, "With a bit more than a year of data, we are seeing some surprising patterns, especially in the tropics." And Aquarius project manager Gene Carl Feldman concluded, "It says that our ability to screen out land contamination seems to be working quite well." 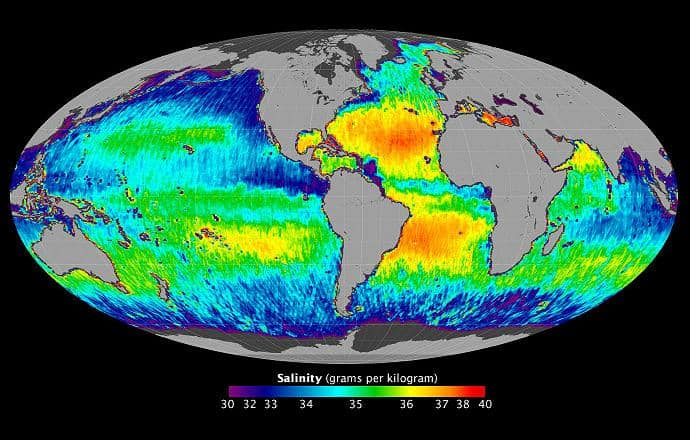 Up next is the NASA video Aquarius: One Year Observing the Salty Seas - Ocean Salinity & Climate published February 28th, 2013. Currently, less than 2% of the ocean is protected. According to National Geographic, there are 5,000 marine protected areas (MPAs) in the world. Yet only 1% of earth's oceans are closed to fishing. National Geographic provides The Ocean | Marine Protected Areas, an interactive map. When I moused over each country, both the percentage of territorial seas covered and the number of protected areas (for a given country) is displayed. Canada has ONLY 1.08% of territorial seas covered and 484 protected areas. 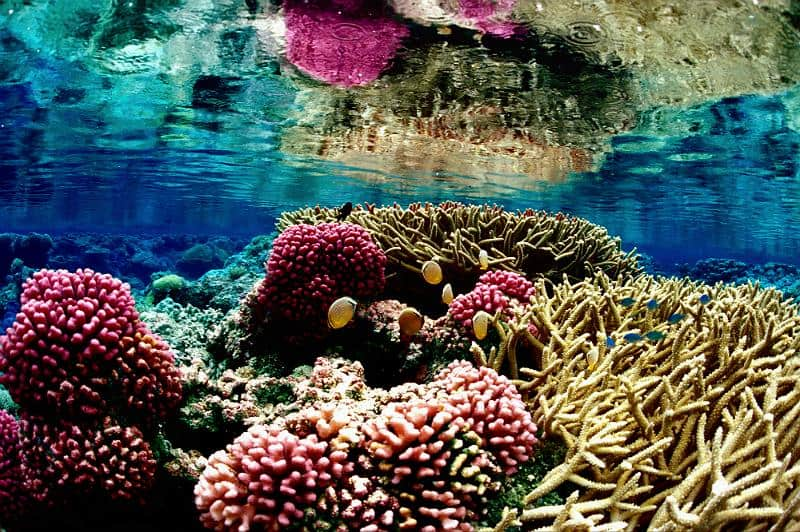 US has 29.39% of territorial seas covered and 750 protected areas. 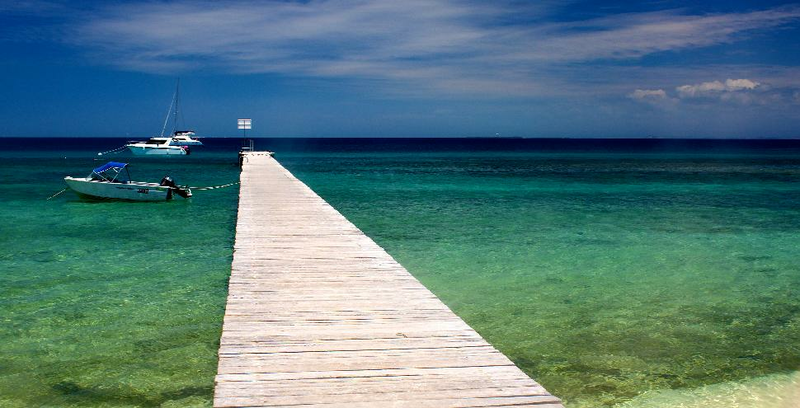 Mexico has 13.99% of territorial seas covered and 118 protected areas. In South America, the numbers steeply decline, particularly along its western coast. As a side note, it comes as no surprise that Canadian entrepreneurs David Katz and Shaun Frankson opened the first Plastic Bank in Peru last month, a cleanup effort I wrote about in Save the Planet and Solve Poverty: Demand Shrilk or Recycled Ocean Plastic. Peru has 2.83% of territorial seas covered and 7 protected areas. Chile has 3.73% of territorial seas covered and 15 protected areas. The coasts of Greenland and Africa are also lacking in marine protected areas. Further east, I was surprised that China is in desperate need of marine coverage and protection. China's numbers are 1.13% of its territorial seas covered and only 43 protected areas. Given China's population (and their reliance on the ocean for food) I thought those numbers would be higher. As a Canadian, I feel we need to protect more of our waterways and coastal regions. I hope that the exemplary example set by New Caledonia inspires other countries around the world to do the same.